ERTS - report of a 15 gallon hydraulic spill to an asphalt parking lot. Release was believed to be due to a failure of the hydraulic line of a vehicle. An ERTS crew is en route to complete clean up. This has been received as service request #1452. This is an automated response, we will post updates as soon as possible! This has been received as service request #1454. This is an automated response, we will post updates as soon as possible! Thank you for your report to Kitsap1. This has been forwarded to the Construction division for review and follow up. Ingress & egress now is dangerous do to speeding traffic going up hill . There is concern with adding more traffic the driveways it would get worse. Customers requesting a traffic study in area. This has been received as service request #1201. This is an automated response, we will post updates as soon as possible! Christy DeGeus has left a VM with the customer. She will handle this discussion. This has been received as service request #1199. This is an automated response, we will post updates as soon as possible! Christy DeGeus has contacted this customer, and discussed the situation. This has been received as service request #1424. This is an automated response, we will post updates as soon as possible! The Traffic Sign Technician checked Lowell St for missing 4 hour parking signs and the currently all seem to be up. I contacted the customer to discuss this area and will stay in contact for future parking issues. This has been received as service request #1420. This is an automated response, we will post updates as soon as possible! Stormwater staff investigated conservation. Found curbing at catch basin to be cracked. Stormwater maintenance crews will schedule concrete repair this summer. They are trying to rent movers with trailers and wanted to know if this can pass the roads in Ridgetop. It might be oversized. They will be passing by Ridgetop Blvd. especially the round about on 3/25/19 (Monday). They are charging extra also because of the trailer that they will have to use to access road. Can a semi access the Ridgetop Blvd. before the round about (Marigold)? Please let them know. Ric, the husband called but requesting to call his wife, Carmen due to he has voice issue. This has been received as service request #1197. This is an automated response, we will post updates as soon as possible! Returned phone call 4/17/19, left message. Excessive delay due to notification system not working. Left contact information. Customer is the office manager for Ridge Top JR High. We placed a wrong way sign right in front of the reader board that is off of Ridgetop Blvd. She would like to know if it can be placed in the median or somewhere where her sign isn't blocked. She is at work until 2:45pm daily. She would like a call please. This has been received as service request #1346. This is an automated response, we will post updates as soon as possible! Basketball Hoop from 13496 Huntley Place nW was placed next to my home and in the street. This is blocking vehicles from parking in that area and allowing children to play and block the street. Can someone please have the owner replaced it back on their property. This has been received as service request #1436. This is an automated response, we will post updates as soon as possible! I am the owner of 13496 Huntley Place and am the guilty party in this instance of the basketball hoop being placed into the cul-de-sac. I'll get it moved back into my driveway by the end of today. Apologies to whom I offended/inconvenienced. Thank you. I appreciate you getting back to us, and moving the hoop. If anything comes up, please contact us. 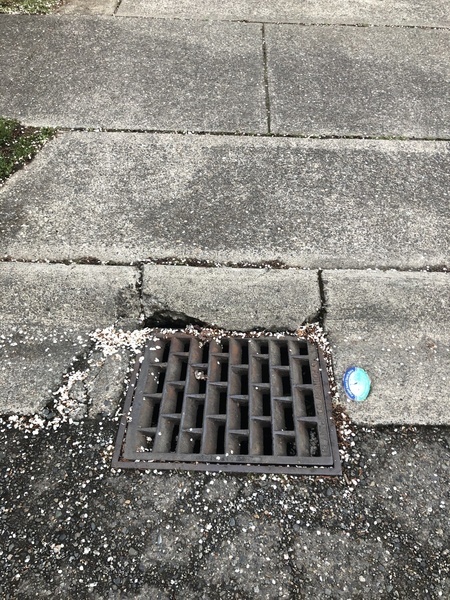 The storm drain grate in front of the address listed has been knocked down into the hole. The reporter has cameras and is willing to supply us with the video footage if needed. This has been received as service request #1391. This is an automated response, we will post updates as soon as possible! Called out to Chuck with Storm Water.